ramblings on the quandry of being both an anarchist and a housewife. As an anarchist parent, and someone who affirms independent thinking in my children, people frequently think that I do not believe in or approve of discipline. This isn’t true. Discipline is necessary. A home, even when run as an autonomous collective, must have rules, so that all living within it can be happy. It needs boundaries, respect and contribution from all members. Children, while completely valid human beings, do not have the maturity or life experience to know how to set or respect boundaries, and they’re instinctively selfish which means they do not have the instinct for contribution. There is nothing wrong with this. The selfishness which is inherent in all children results from the fact that when starting out, they have had to do nothing. A baby’s responsibility is to grow. Their selfishness IS their contribution, because they have to develop before they can contribute. A toddler’s responsibility is to explore and become independent, but this is soon joined but necessary discipline. They need to very young start learning that other people have rights, and that violating these rights is not okay, or else they will not be able to be respectful, contributing members of their collective. As children become older their responsibilities increase. Cleaning up after themselves, and helping take care of the home, as well as younger children and pets, become daily responsibilities. When they try to balk at these added responsibilities, there must be disciplinary action. What kind of disciplinary action? Much of it is just logical consequences. If you make a mess, you clean it up. If there is refusal, then there is a removal of privileges until the necessary action has taken place. If The Wizard refuses to fulfill his responsibilities, he goes to his room until he is ready or willing to do so. Today, he did not want to respect others, listen, or contribute to cleaning the house, and was sent to his room. However, we didn’t want to just put cleaning the house on hold and wait for him, nor did we want to just let him “get out” of his responsibilities. The Husband, in a burst of ingenuity, told him to write a letter, explaining why he should listen and contribute. Now, The Wizard is seven years old, and in the second grade. This obviously would not work for younger children, but they could be asked to write a short apology, or even younger children could draw a picture of how they feel, or showing the negative result of their negative behavior. These alternatives could also be implemented when there is learning or behavioral disorders, or if it’s a very difficult assignment to start. With The Wizard, as this was a disciplinary action that had never happened before, there was of course, revolt. Screaming, yelling, statements of the injustice of it and of the world, kicking the wall. Which resulted, in tired, frustrated parents, yelling in return. A “time-out” and assignment that should have taken no more than a half an hour, took instead, an hour and a half. However, we told him repeatedly to write what he was screaming about instead, and once he ACTUALLY started doing so, it was a big relief for him. It allowed him to express himself, and at the same time think about how his contributions are necessary. It allowed him to say why he was upset, and slowed and calmed him. At the end, even he declared it a success. Which is a good way to measure these things. Kids are not going to like disciplinary actions. But the disciplinary action will demonstrate itself to either be a success or not. Sometimes it might take a battle in order to get our kids to follow through, sometimes we need to use alternate methods to find what works for our kids particularly. Positive disciple ends with discussion, with our children understanding the reasoning behind the action, and it is adapted for the children and the situation. It results in everyone being able to express themselves, and resolving the original problem. Positive disciplinary methods are respectful, and when in our frustration, we treat our children with a lack of respect, we owe them an apology. Everyone makes mistakes, and showing our children that they’re not the only ones who need to apologize, and they’re not the only ones who need breaks and time outs and “cool downs”, makes them feel equal and understood. If we treat our children with respect, and ask for it in return EVENTUALLY (when they have the emotional and mental maturity) they will return the favor. 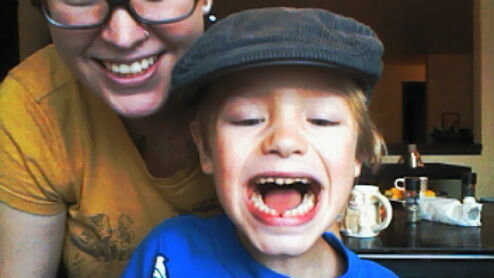 In other news, The Wizard lost his first tooth today! This entry was posted in children, discipline and tagged children, discipline, journaling, self-expression.